19 October/November 2018 unmanned systems inside without wasting time moving the drone around and find- ing a new spot for f lying. The drone can take off and land in one spot and do its thing." 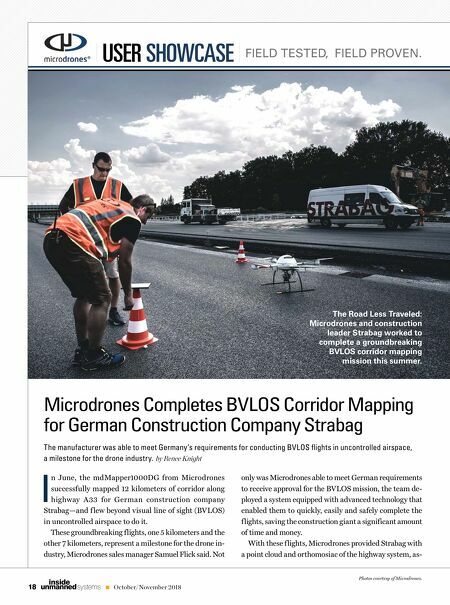 Preparing for the Flights In Germany, regulations restrict unmanned aircraft sys- tems (UAS) to f ly BVLOS of the operator, which limits what companies like Strabag can do with the technology, Flick said. One of the biggest challenges with this project was obtaining permission to f ly, but because Microdrones already had a relationship with German authorities, it didn't take long for their request to be approved. "We received permission in less than four weeks," system engineer Jonas Reitz said. "We've been working with au- thorities for maybe one year now, so they know exactly what we're doing. They know our features and how we're working." The relationship between Deutsche Telekom and German Air Traffic Control also played a role in this successful mission, Flick said. 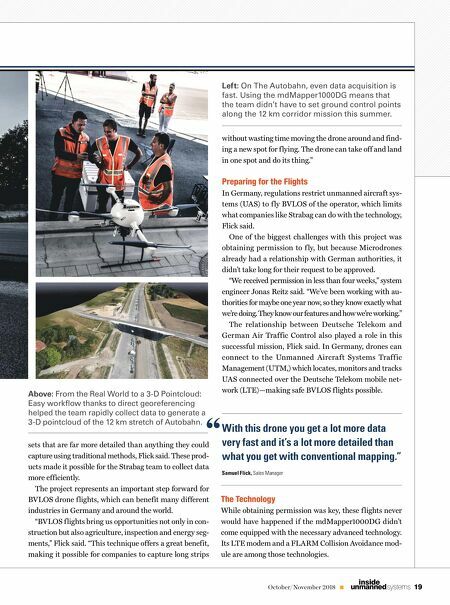 In Germany, drones can connect to the Unmanned Aircraft Systems Traffic Management (UTM,) which locates, monitors and tracks UAS connected over the Deutsche Telekom mobile net- work (LTE)—making safe BVLOS f lights possible. sets that are far more detailed than anything they could capture using traditional methods, Flick said. These prod- ucts made it possible for the Strabag team to collect data more efficiently. The project represents an important step forward for BVLOS drone f lights, which can benefit many different industries in Germany and around the world. "BVLOS f lights bring us opportunities not only in con- struction but also agriculture, inspection and energy seg- ments," Flick said. "This technique offers a great benefit, making it possible for companies to capture long strips The Technology While obtaining permission was key, these f lights never would have happened if the mdMapper1000DG didn't come equipped with the necessary advanced technology. Its LTE modem and a FLARM Collision Avoidance mod- ule are among those technologies. With this drone you get a lot more data very fast and it's a lot more detailed than what you get with conventional mapping." Samuel Flick, Sales Manager " Left: On The Autobahn, even data acquisition is fast. Using the mdMapper1000DG means that the team didn't have to set ground control points along the 12 km corridor mission this summer. Above: From the Real World to a 3-D Pointcloud: Easy workflow thanks to direct georeferencing helped the team rapidly collect data to generate a 3-D pointcloud of the 12 km stretch of Autobahn.